How is your garden growing? Fall is officially here with cool temperatures and hot temperatures all in the same week. My garden didn’t fair too well this year, but I do still have a few tomatoes changing to red, many peppers, and an abundance of herbs that are all holding up well. If you are lucky enough to have tomatoes still growing this recipe is a perfect one for transitioning to Fall. One thing I love about quiche is that it can be eaten any time of day either warm or cold. 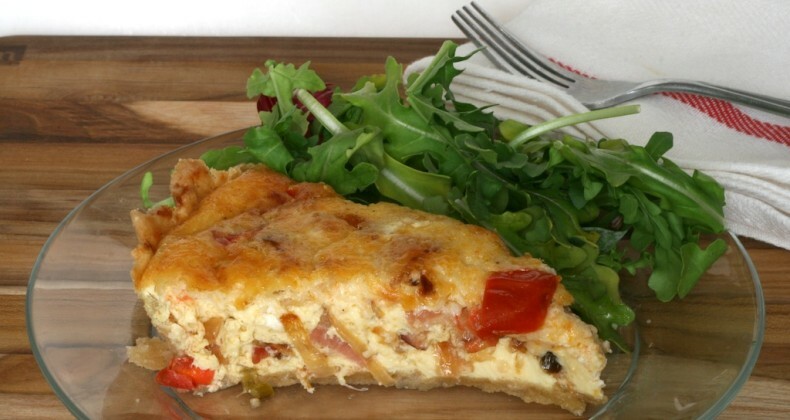 It is perfect for breakfast or paired with an arugula salad for a light lunch or dinner. I threw in some caramelized onions in the quiche because I love onions and eggs together. Plus the sweet caramelized onions pair so well with salty bacon. I recommend you bake this quiche and pack it up for a picnic this weekend. Go out enjoy those lingering warm days. 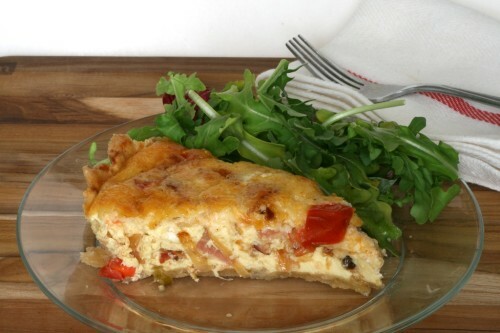 You will only use half the crust recipe for this quiche. In a sautÃ© pan over medium heat place oil and sliced onions and allow to caramelize. Stirring frequently until the onions take on a golden color. About 30 minutes. 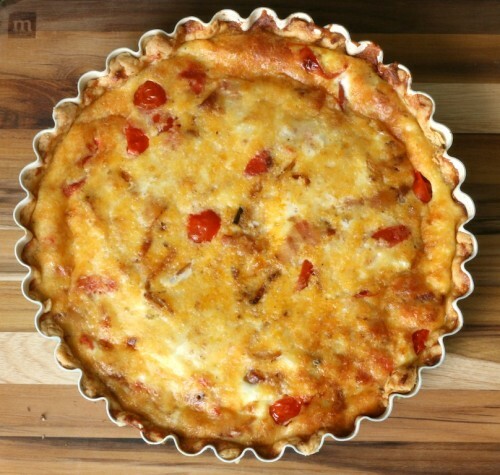 Preheat oven to 425 degrees F. Press half of the dough into the quiche pan. In a bowl mix together eggs and milk. Pour mixture over crust. Place tomatoes, bacon, and onions on top of the eggs. Cover with cheese. Bake for 30 minutes until the center is set (no longer jiggly). Allow to cool slightly before slicing. I don’t make enough quiches, but this recipe makes me want to change that! My last two tomatoes are barely turning red but the plant is almost dying. My herbs are doing well though but it’s getting too cold up here in NY. I love this quiche..I’ll have to make it with my last two guys to celebrate a great year.